It may surprise you how large a volume of your eCommerce sales are driven by site search. One study by SearchNode found that between 20-60% of e-commerce revenue is generated by customers who use site search. Econsultancy research suggests 30% of site visits depend on site search. With these numbers in mind, it’s important to make sure your eCommerce site search is meeting consumers needs and expectations. Some customers naturally gravitate towards site search right from the point of arrival on your site. Others will only use it as a last resort if they can’t find what they want by navigating your site. Whilst some users seem to favour search on any site they visit, patterns of search use do vary from site to site. Users may be more inclined to use search on a site if there are fewer ways to navigate without search, if there is an abundance of product options or for a variety of other reasons. Those visitors that use search do tend to convert at a higher rate but it’s important not to misunderstand this phenomenon. People using search are probably more inclined to buy anyway and know what they want, compared to idle browsers, so don’t be misled by the higher conversion rate. What is important is to make sure these engaged users find what they are actively looking for by getting the search experience they need. Site search can be highly revealing about how your customers think. Scrutinising the search term history on your site can help indicate whether you’re mislabelling products or not making certain keywords appear in product descriptions. Site search data can also inform you how to organise and even describe your products. One major electronics retailer was surprised to find a customer had performed a search for ‘best laptop for looking at pictures of cats on the internet’. Discoveries like this can reveal what customers really want from your products. Don’t neglect your in-site search data. Checking it regularly can really inform how you structure your site and how you describe and organise your products. Even at this advanced stage in digital adoption, you can’t assume that customers know the basics of how site search works. Check your search terms and you may be surprised to find the pre-populated text you put in the search box, such as ‘search this site’, is a common term. That’s because many users don’t realise you can type straight into the search box that’s prepopulated with the words ‘search this site’ and instead click on the magnifying glass icon next to it thinking that will take them to the search feature. It’s important not to make assumptions about how your customers use search. Not only should you regularly examine search trends in your analytics data but you should also aim to conduct regular user testing to see exactly how real life customers are interacting with your site search. The results may surprise you – particularly if you’re entering new markets where your audience may take a very different approach to search. It’s important to think carefully about how prominently you want to offer search on your site. The more prominent it is, the more likely customers are to use it. Sites with a huge product range almost invariably make the search box prominent as it’s the customer’s best chance of finding what they’re after. But for many eCommerce sites, it may be better to encourage different methods of site navigation that expose customers to a wider range of products. That’s why many fashion sites offer large navigation panels that allow customers to browse broad product categories such as ‘new items’, ‘workwear’ etc. But don’t take this too far! Don’t make the mistake of burying the search feature on your site, making it hard for customers to find. This will annoy highly committed consumers who just want to search for the product they know they want. 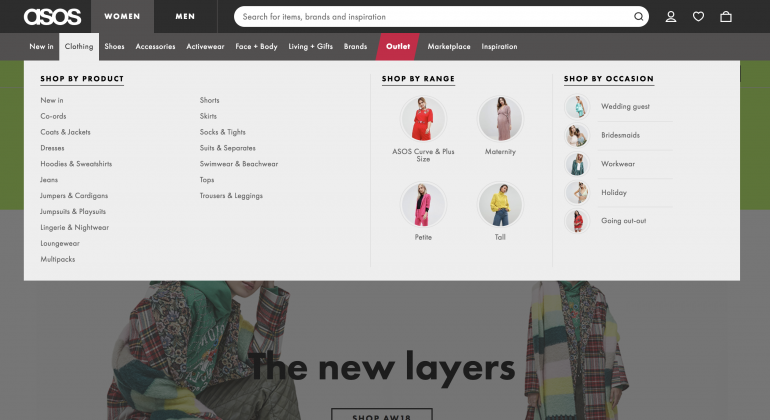 ASOS has a prominent site search box at the top of the page, inviting customers to search its site for products – even on non-commercial pages such as the Help and About Us pages. Search can be adapted to suit the type of eCommerce you do. Waitrose offers a feature that lets users compile a multiple product search – basically, a shopping list. Some of the more cutting-edge fashion sites have also recently started experimenting with image search. Upload a photo of a celebrity wearing an item you like and you can search for similar items. These kinds of niche search features may be relevant for your business but you’ll need to test them carefully with your users to check you aren’t confusing them. Customer expectations for search performance are set by Google, which offers a level of search sophistication few eCommerce sites can hope to match. Users that have grown accustomed to being offered autocomplete and corrected results, if they misspell a search term, expect your site search to offer the same facilities. Unfortunately, there’s no way of getting around this high level of expectation but you should try not to disappoint them too much in terms of the search features you can offer. Offering a good search experience isn’t just a case of uniting the customer with what they want. It’s also important to be able to show customers what to do after performing a search. Perhaps they need to refine their search better, for instance by applying filters that make sense to them. Many sites now offer search scopes in the search results to help customers quickly refine their results – for example, if you want to search Amazon for an item of makeup called ‘Dream matte mousse’, the results will start to suggest ‘Dream catcher’ – in the Home & Kitchen category as soon as you’ve finished typing the first word. This is presumably the most popular item brought with this keyword. It will also suggest a number of other results in other categories, such as kids dream tents. If your site doesn’t have what the customer is searching for, make sure they’re offered some relevant alternatives or told when that product will be available again. If the product is in stock, make sure it’s easy to conclude the purchase process from the results page or to refine the search further and get the exact version they want. It’s important to make it clear what you’re doing when you offer alternative results, as customers quickly get frustrated if they don’t understand why their results aren’t what they’re looking for. A study by eConsultancy suggested that only a small minority of eCommerce brands did much work to optimise site search. When it’s clear that visitors using search are already more committed to buying products, it seems a major oversight not to be seeking out the best ways to serve them. Investing some time and effort in understanding and improving your site search may be the best investment you’ve ever made.